The campus, Santa Barbara and Mission Blvd. 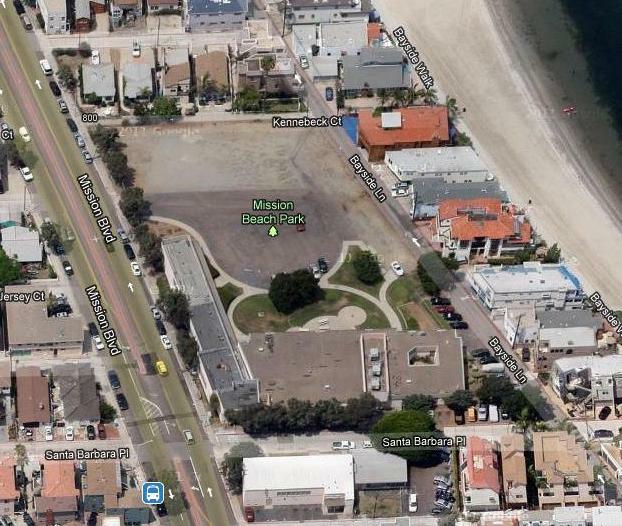 Google map shot of former Mission Beach Elementary School – labeled here as “Mission Beach Park”. 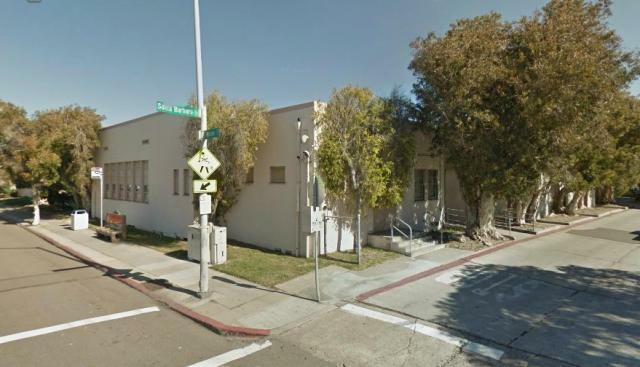 The 4 to 1 vote by the Board was the culmination of the process to cement the controversial sale of 2.23 acres of prime public school land, a half block from the Pacific Ocean and mere yards from Mission Bay. Mayor Filner, community planners and civic activists, as well as residents pleaded with the Board to keep the land in the public arena, and work with either the City or developers on alternatives. The site was sold for $18.5 million to duo of developers, doing business as McKellar-Ashbrook LLC, registered in La Jolla. The School District has made the selling off of former campuses one of its chief methods of raising funds – a tactic heavily criticized by those activists. It has to raise $50 million in 2013 by selling land to help plug an estimated $84 to $92 million budget gap. Closer view of Mission Beach Park – now to be developed by private developers. The campus has sat underutilized for years as the school-aged child population in Mission Beach plunged dramatically over the decades. And developers have craved the site for all those years – eying the primo land for future high-density apartments and condos. Community activists wanted a park, gardens, and police substation. Mayor Bob Filner – in a personal appearance – had made a pitch to keep the property and have the City work with School District, to partner in order “to keep the land in public hands. I would have liked to work with you to say, ‘Let us buy it,’ ” Filner said. But the Board was not convinced – and a majority was in no mood to change directions on this sale as a previous sale of the site had been halted at the last minute when School Board Trustee Sheila Jackson had switched her vote on the matter of the sale. Since then new Trustee Marne Foster has taken over the seat and was one of the four approving votes. The deadline for other public agencies to make bids on the property was long over, but Filner was not in office at that time. The disapproving vote was cast by Scott Barnett – who represents the area where the proposed sale is taking place and who has consistently opposed the sale by the District of its lands. Barnett made a motion before the vote to sell the property to the city for $11 million, but in a partnership that allowed the District to retain a $7.5 million “equity ownership” in the land. But Barnett couldn’t get any other Board member to second his motion, so it failed. Another view of the 2.23 acres of prime public land now heading for the private portfolio of developers. Barnett termed the land sale “a cheap, quick fix” as he has been lobbying for options that would have the District keep the site and allow it to generate funds via leases, etc. June 22, 2012: the Board voted to place 7 surplus properties on the market. Public agencies – who get first dibs – were notified several days later, plus ads for the sale have been published. September 7, 2012: the deadline for public agencies to submit an offer to buy property; after that, properties become available to private sector bids. Late September, 2012: bids from the private sector opened, with the sale price able to be raised by an oral bidding auction. The board must vote on each agreement of purchase with the highest bidder. Other residents complained that the sale would allow more high density development that would bring in more congestion, traffic, crime and acerbate other community problems. They called for a combination use of park space, a police substation and neighborhood gardens. This is for the children, said trustee Marne Foster. Sacramento made us do it, said trustee Kevin Beiser. We promised not to waffle this time, said Board president and waffler-in-chief, John Lee Evans. Trustee Richard Barrera seemed embarrassed to vote for the property sale and apologized for doing so to Mayor Bob Filner. Mayor Filner believes public lands should remain in public hands. He was sympathetic to trustees’ having to balance another red-ink budget and recalled his own early days on the Board of Education. Yet, with the District making efforts to fill its budgetary holes, trying like crazy not to have to lay off teachers, and with developers licking their chops for the last few years, applying pressure on everyone involved, there was little sympathy on the Board for such options. Challenging the notion that the district so desperately needs to sell this particular land quickly, however, is the fact that the district projects it will end the current fiscal year with a budget surplus of close to $15 million. Three more properties are due to be auctioned off in the next month. What a sad, typical, San Diego story. Government now has to make money. freeways were cut through it had been subdivided to serve special interest groups. one beyond the reach of its citizens, so gentrified from border to border only the world’s wealthiest will be able to live here. It’s not difficult to imagine the price tag of those condos when the two acres they’ll sit on themselves cost $18.5 million. Although RDA ending, for public benefits project and public use the City still has Eminent Domain powers to buy the school district property from the highest bidder, at the same $18.5 million cost through existing State law. See the California Code of Civil Procedure Section 1230 to 1273.05 for our Eminent Domain laws. Civic San Diego, the former CCDC Redevelopment Agency (RDA) has been hoarding $1 Billion in assets, including $400 million in cash, bond proceeds, and reserves. The Department of Finance (DOF) required Due Diligence Review (DDR) for non-housing assets is past due. Civic San Diego will complete the DDR mid-summer 2013, for final DOF approval in Fall 2013. Therefore this fall the City’s General Fund and San Diego Housing Commission (SDHC) will have access to the previous off limits $1 Billion RDA source of Revenue, and will have money to buy public lands. One of the drastic problems that Mission Beach has is that it is becoming a ghost town of time-shares, vacation and weekend rentals. Walk or bike along Mission Bay paths and tell me how many of those houses, condos or apartments actually have residents in them. And plus ghosts don’t vote. … Except in certain states. What a School Board meeting. Trustees were begged to act like trustees instead of auctioneers. The Mayor even showed up and gave them an opening. ONLY ONE OTHER VOTE WAS NEEDED: one person could have joined Scott Barnett voting No and the deal would have died. Duplicitous SDUSD staff, box-checkers all, could have talked with Mayor Bob Filner’s office in December instead of Back When with developers’ friend Mayor Jerry Sanders and his aptly-named “development services” department. 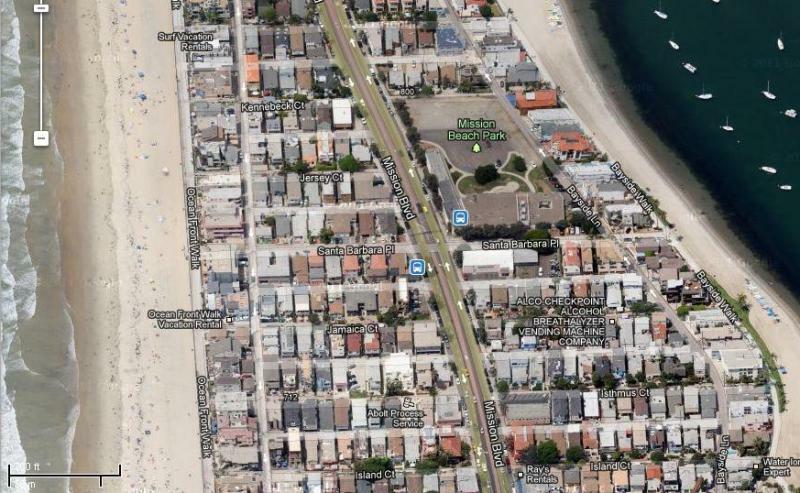 There could have been an entirely different future for 2+ acres in the middle of Mission Beach. Frank Gormlie has a good point about numerous vacant properties becoming problematic in Mission Beach. A hopeful community-serving outcome such as LaPlayaHeritage suggests seems unlikely. Just don’t forget that School Boardmembers Barrera, Beiser, Evans and Foster made it all possible.